I came across this article recently. Although it primarily relates to choosing colours for fly fishing, it is an excellent scientific explanation of how fish view colour. I thought I would share it just to give everyone another excuse to buy some different coloured lures! Read this article and you may never look at your flies the same way again. IS COLOR IMPORTANT? This is a serious question for fly tiers and fly fishermen to ask. Some anglers maintain that the choice of color is critical, while others say it is not important. Scientifically speaking, there is evidence to suggest that both points of view may be correct. There is good evidence that picking the appropriate color or colors will, under certain conditions, improve your chances of attracting fish, but science can also show that in other situations, the color of your fly is of limited value or no importance whatsoever. Fish have been around for more than 450 million years and are remarkable creatures. Over the thousands of centuries, they have made many superb adaptations to survive in the marine environment. Living in the world of water is not easy, but it does present some environmental opportunities as well as serious challenges. Sound, for example, travels almost five times faster and much better in water than it does in air. The ocean is actually a very noisy place. Fish capitalize on this by having an excellent sense of hearing, using both their inner ears and lateral lines to detect prey or avoid enemies. Water also contains unique chemical compounds that fish utilize to identify other members of their species, tell when reproduction time has arrived, find food, detect predators, and perform other functions. Fish have evolved a remarkable sense of smell that is thought to be about one million times better than that of humans. Water, however, presents a serious challenge for fish and fishermen when it comes to vision and color. Many characteristics of light quickly change as it moves through water. The first thing to realize is that the color of your fly in the water is almost always different from what it is in the air. I have to be a little technical to explain this, but I think if you bear with me, you’ll have a better understanding of how fish perceive color and how this impacts the flies we tie and use. And while I mostly refer to fish and fishing in salt water, these same principles apply to the freshwater environment. The light that humans see is just a small part of the total electromagnetic radiation that is received from the sun. We see what is called the visible spectrum. The actual colors within the visible spectrum are determined by the wavelengths of the light: the longer wavelengths are red and orange; the shorter wavelengths are green, blue, and violet. Many fish, however, can see colors that we do not, including ultraviolet. When light enters water, its intensity quickly decreases and its color changes. These changes are called attenuation. Attenuation is the result of two processes: scattering and absorption. The scattering of light is caused by particles or other small objects suspended in the water — the more the particles, the more the scattering. The scattering of light in water is somewhat similar to the effect of smoke or fog in the atmosphere. Coastal waters generally have more suspended material due to river input, material stirred up from the bottom, and increased plankton. Because of this greater amount of suspended material, light usually penetrates to a lesser depth. In relatively clear offshore water, light penetrates to a greater depth. Light absorption is caused by several things, such as the light being converted into heat or used in chemical reactions such as photosynthesis. The most important aspect for fishing is the influence of the water itself on the absorption of light. The amount of absorption is different for different wavelengths of light; in other words, various colors are absorbed differently. The longer wavelengths, such as red and orange, are absorbed very quickly and penetrate into the water to a much shallower depth than the shorter blue and violet wavelengths. Absorption also restricts how far light penetrates into the water. At about three meters (about 10 feet), roughly 60 percent of the total light (sunlight or moonlight) and almost all the red light will be absorbed. At 10 meters (about 33 feet), about 85 percent of the total light and all the red, orange, and yellow light have been absorbed. This has a direct bearing on how a fish perceives a fly. At a depth of 10 feet, a red fly appears gray, and it eventually appears black as the depth increases. With the increasing depth, the now dimming light becomes bluish and eventually black when all the other colors are absorbed. It should now be clear how the depth of the water or distance from a fish affects the visibility of your fly. In extremely shallow and very clear water, colors may look similar to their appearance in the air; as your fly gets just three feet deep or three feet away from a fish — or less if the water has limited clarity — the colors will start to change, often with surprising results. Scientists really do not know exactly what fish see, or in other words, what images reach their brains. Most research on the vision of fish is done either by physical or chemical examination of different parts of their eyes or by determining how laboratory fish respond to various images or stimuli. Making broad generalizations about a fish’s vision is complicated by the fact that different species may have different vision capabilities and that laboratory results may not represent what happens in the real world of an ocean, lake, or river. Physical studies of the eyes and retinas of fish show that the majority can obtain a clearly focused image, detect motion, and have good contrast-detection ability. A limited number of experiments have shown that a minimum level of light is necessary before a fish can recognize colors. Another finding, but one that needs more study, is that some fish favor a specific color. This point may contradict or affirm your own fishing experiences, but remember that the attractiveness of your fly is a combination of many things, including its motion, shape, and color, as well as the scents in and depth of the water. Most fish have an adequate sense of vision, but this is usually not so impressive as their sense of smell and ability to detect vibrations through their lateral lines. Fish usually use their sense of hearing or smell to initially perceive their prey, and then use their vision only in the final attack. Most fish can see in low-light conditions or dirty water, and a few can see objects over moderately long distances. Fish such as tuna have especially good vision; others less so. Fish are usually nearsighted, although it is believed that sharks are farsighted. The majority of fish have developed eyes that will detect the type of colors typical of their environment. For example, inshore fish have good color vision, whereas offshore pelagic fish have limited color vision and detect only a few if any colors other than black and white. This is not surprising from an evolutionary point of view, because nearshore waters are lit with many colors; offshore waters, on the other hand, are mainly blue or green and contain few other colors. The actual ability of a specific color to attract or even repel fish has fascinated both anglers and scientists. While there are no uniform answers, scientists have conducted experiments on this interesting question. For example, studies of sticklebacks during their spawning season have shown that males, which then have bright red coloring on their bellies, become very aggressive to decoys that also have bright red bellies. Similarly, decoys with extended bellies, which look like females carrying eggs, attract the males. But it isn’t that simple: it wasn’t just the case of a perfect decoy imitation, but rather the color or shape of the decoy. In addition, it was noted that a passing red car, seen from the fish tank, also excited male sticklebacks. This is perhaps the most important point to remember: Most gamefish detect their prey by seeing the contrast of the forage against various colored backgrounds. The level or type of contrast depends upon many factors: time of day, type of bottom, transparency of the water, whether it is cloudy or sunny, and perhaps even the time of year. I wish I could be more specific, but such scientific information is not available. The best I can do is provide some general suggestions and information; determining the right color or color combinations will take a lot of fishing and experimenting under various conditions. Keep these ideas in mind the next time you tie or select flies. 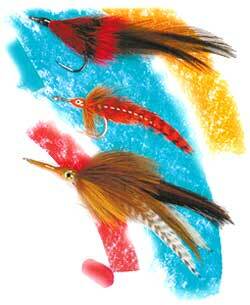 Try to consider what the colors in your fly will look like at the depth you are fishing, and chose appropriately. For example, since red is the first and blue is the last color absorbed, it makes more sense to use a blue fly when fishing deep. If you are trying to match a particular bait, the color of your fly should match the color of the bait for the depth you are fishing. In other words, try to match the underwater color rather than the color of the bait in air. Many fish feed by looking up toward the surface of the water. In doing so, however, they have difficulty distinguishing specific colors, and the contrast of the prey against the surface becomes more important. When a feeding fish is looking up, a dark silhouette, even against a dark night sky, provides the maximum contrast and is attractive to predators. Selecting a fly based on contrast, rather than on specific colors, is often the key to enticing a fish to strike. Black is the least transparent color and gives the best silhouette at night. Black is probably the most visible color under most conditions. If your fly has two or more colors, the darker color should be over the lighter colors. Almost all baitfish have this color arrangement, and dark over light usually produces good contrast. Different colored flies may be equally effective or ineffective simply because they are similar in color at the depth the fish see them. If you are fishing your fly in deep water, the motion and any noise or disturbance it makes might be much more important than its color. Increase the contrast of the fly if the water is dirty; decrease the contrast if it is clear. A good profile is important when vision conditions are low (nighttime or dirty water). Black and red flies offer good profiles. Some colors, such as chartreuse, always seem to work better than other colors. Yellow-and-white and chartreuse-and-white are also favorite pairings. Red and white, which provide good contrast under many conditions, is a popular combination for many anglers. Recent research shows that many fish sense polarized light. Humans do not have the ability to separate polarized from regular light. Regular light vibrates in all directions perpendicular to its direction of travel; polarized light, however, vibrates only in one plane. When light is reflected off many nonmetallic surfaces, including the ocean surface, it is polarized to some degree. This explains how polarizing sunglasses work: they block out the horizontally reflected polarized component of light from the ocean surface which causes most of the glare but permit the vertically reflected component to pass through. It is not fully understood why some fish have the ability to sense polarized light, but there are interesting possibilities. Being able to detect polarized light might help fish in their migrations and ability to swim closely with others of the same species. The ability to sense polarized light must certainly be related to the fact that when light is reflected off surfaces, like the scales on a baitfish, it is polarized. Fish that can detect polarized light have an advantage in finding food. Polarizing vision can also enhance the contrast between almost transparent prey and the background, making the prey easier to see. Another conjecture is that having polarizing vision can let fish see objects that are farther away — perhaps three times the distance — as fish without this ability. If this speculation is correct, it may answer the question why some fish can feed under very low-light conditions. And there is more polarized light at dawn and dusk, which might explain why some fish, such as striped bass, seem to feed more aggressively at these times of the day. If the ability to sense polarized light helps fish to find food, then it follows that flies that reflect polarized light should be more attractive to such fish. Some natural fly-tying materials, such as polar bear fur, are especially good reflectors of polarized light. Bucktail, on the other hand, is a relatively poor reflector of polarized light. There are artificial materials that simulate fish scales and various tinsels that claim to be excellent reflectors of polarized light. Flies with irregular surfaces may reflect more polarized light than smooth flies. I suspect that in the coming years, as we learn more, there will be an increased use of polarizing materials in flies and lures. As you can see, light and color can get pretty complicated. But let’s not forget what we are trying to do: have our flies imitate pieces of fish food. Fish are not very clever, and they attack prey — or flies — as an instinctive behavior motivated (or so we think) by one or more stimuli. These stimuli include movement, shape, sound, contrast, smell, color, presentation, and certainly other things unknown to us. Successful flies should probably include some of these stimuli, and then we need to consider other variables such as the time of day, the tide, and the presence of other fish or fishermen. This is a complicated venture, of which color can sometimes be an important aspect, but only if the fish can see the color. Dr. David Ross is a scientist emeritus at the Woods Hole Oceanographic Institution and the author of The Fisherman’s Ocean (Stackpole Books). He is also a regular columnist for Saltwater Fly Fishing Magazine. He can be contacted atDRoss@whoi.edu. This article first appeared in Fly Tyer Magazine. Copyright © 2005-2006 Dr. David A. Ross and Fly Tyer Magazine. This entry was posted in landangler freshwater fishing, Landangler's View, Landanglers Fishing Tips and tagged Australia, fish and colours, Fly Colours, what colour lures work best, what colours can fish see. Bookmark the permalink.